Sitting atop an ultra-stable tripod and mount, the LX200-ACF combines an amazing array of features: Primary Mirror Lock to eliminate focus and mirror shift during long exposures; large, high-quality worm-gear drives in both axes to provide extraordinarily smooth movement, and Smart Drive, delivering Permanent Periodic Error Correction (critical for long exposure astrophotography). Advanced Coma-free Optics (ACF): Meade's ACF optical design eliminates the typical aberrations of all mirror optics. Thanks to ACF, the stars are also point-shaped right out to the edge of the image field, displaying no elongated comet-like distortions. The image field is flatter than that of classic Schmidt-Cassegrain telescopes. ACF optical systems show their strengths especially in astrophotographic applications. Ultra-High Transmission Coatings (UHTC): This special multi-layer coating on the front correction plate provides up to 15% more light transmission. The result -brighter star clusters, finer details in nebulae and more surface detail on planets! The control of the telescope is through the AutoStar II system. Nearly all functions of the telescope are accomplished with just a few pushes of AutoStar II’s buttons. Because the AutoStar II system uses flash (rewritable) memory, your system will be able to grow when new features and enhancements become available. Automatically move the telescope to any of the more than 145,000 objects stored in the object library. For example objects of the Messier Catalog, NGC Catalog and 227 named Objects. Take a guided tour of the best celestial objects to view on any given night of the year. Access a glossary of astronomical terms. The AutoStar II handbox has soft-touch keys designed to have a positive feel. The LCD (Liquid Crystal Display) is backlit with red LEDs (Light Emitting Diodes) for easy viewing in the dark. The backlit display, key arrangement, and sequential menu structure make AutoStar II extremely user friendly. 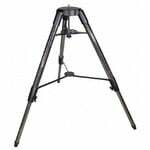 Level North Technology - alignment is especially easy with this telescope. The signal from the built-in GPS receiver sends the computer controller the date, time and geographical location. Level North Technology adds information about the current orientation of the telescope. The telescope then automatically moves to from one to three stars (depending on the accuracy required). All you have to do is centre the stars in the eyepiece. This last step ensures that the accuracy of the alignment is successful. 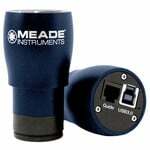 Meade's ACF optical design eliminates the typical aberrations of all mirror optics. 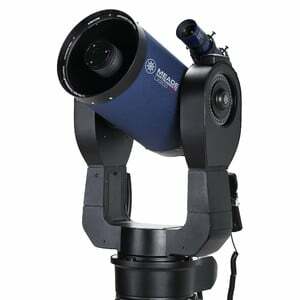 The control of the telescope is through the AutoStar II system. The Smart Drive technology enables the permanent periodic error correction (PPEC).